Hollywood knows something B2B storytellers don't. It's something businesses need to know if they're going to craft coherent, effective brand stories. What is it? The short answer is, everybody likes a hero. We recently interviewed Park Howell, Founder of Business of Story, and he laid out the 10-part story cycle process that Business of Story uses to help their clients tell compelling stories that move the needle. 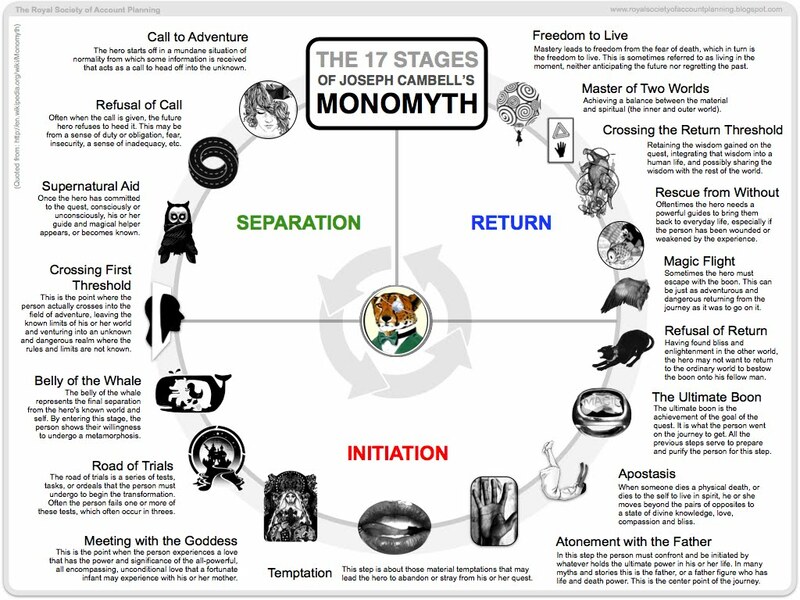 It's based on Joseph Campbell's 17-step hero's journey. Campbell is America's foremost mythologist; he's studied stories that have been around since the beginning of time, across all races and religions, and come up with a universal story structure interwoven in the best of them. Park's company simply overlaid that structure with their work on brand storytelling. They asked how a mythological hero's story could apply to the business world. One of their clients experienced over 300 percent growth in the first five years of reframing their brand's story. Another experienced 400 percent over a decade. So yeah, Park's a pretty good person to talk about this stuff. His suggestion? Print out Joseph Campbell's 17 steps, grab your beverage of choice, sit down, and watch the very first Star Wars. You'll see that it plays out in exactly the order that Campbell describes--because George Lucas was a student of Campbell's in film school and wrote his thesis about the hero's journey. He applied the same framework to Star Wars--and we all know what happened from there. However, it was around long before Luke and Darth battled it out. Look at Homer's Odyssey or The Wizard of Oz . . . any great story that grabs your attention will probably have elements of this universal structure. Park's work is all about translating this proven story structure into the modern stories of business brands. Making parallels between the two is shockingly effective--and pervasive. We could show you 30-second TV commercials that use all 10 of these steps. If you're looking to hone your B2B storytelling, march through these 10 steps (or "chapters") of the hero's journey. In Chapter 1, you've got to set the stage for every story and put it in context. In B2B storytelling, that means creating your primary brand statement. What category within that industry do I operate in? What's my specialty within that category? What's my No. 1 specialty? When you write out your statement and get to No. 4, you're determining what you do better than anyone else. That becomes your backstory and the foundation of your brand. From here, through the next nine steps, you're going to start elevating your brand out of the "functional commodity" mindset into much more enlightened customer engagement. Most brands make the mistake of thinking they are the hero. In actuality, your customer is the hero. Don't make the mistake of thinking your brand is the hero; your customer is the hero. When Business of Story puts on a brand workshop, they ask participants to identify their top three audiences. Keep it simplified: who are they? Why do they matter? Most important, what do they want? In Chapter 2, you identify your own top three audiences. Business of Story has an interview guide to help you create a persona out of those customers. This guide also uses the 10-step story cycle process. You can follow the guide and write down a very detailed persona, using the exact same process you're using to create your own brand story. In every great story, you have to be able to identify with the protagonist or central character. And they've got to want something. Something that's compelling enough to drive them through hell or high water, risking life and limb to get it. The same is true in your B2B storytelling. After you've asked yourself who your audience is in chapter 2, ask yourself, what do they want? What's at stake for them if they buy into your product/service? What do they stand to lose if they don't? The better you understand that, the better able you are to talk about your brand on the customer's terms instead of your own. Here's where conflict comes into play. Now begins what Hollywood calls an "inciting incident." Something has to happen in the story to propel it forward, in order to take the hero from an ordinary to an extraordinary world. In The Wizard of Oz, what happens? A tornado transports Dorothy. In Star Wars, Luke Skywalker comes back to find his aunt and uncle burned to death on Tatooine, and he's thrust into an adventure that takes place in extraordinary new worlds. Again, the same holds true in the world of branding. There has to be disruption, in either the market or your customer's lives, in order for your brand to be urgent, relevant, and needed. Ask yourself: "what's happening in my customer's life where I can come in and fill that void?" It could be a disruption that you've created, like trying to level up your customers. Or it could be a disruption that's already happened in the marketplace. Very important in this phase is to ask yourself about disruptions in the marketplace that your brand is reacting to, then to ask how that disruption is affecting customers in their space. How are you filling that void for them? In Chapter 4, you write the unique value proposition of how you respond to that disruption in the market in your own unique way, based on your brand position. The conflict continues. Without conflict, you have no story. Conflict is the marrow of story. Without conflict, you have no story. Conflict is the marrow of story. This is where businesses often get lost in B2B storytelling, because they want to look like everything's peachy. But that's just not the way the world works anymore. Since your customer owns your story over you, given technology and social media, you really have to address the conflicts. On the business side, what are your weaknesses and threats? Be really honest about those; embrace them. On the customer side, what keeps them from buying your product? Is it price? Availability? A friend telling them they could buy a cheaper version elsewhere? Customers have to overcome all kinds of obstacles and antagonists to buy into your product. Examine the obstacles in every stage, from awareness (where are they going to find you? ), to the initial adoption ("OK, I guess I'm gonna try this"), to the appreciation stage (how are they sharing your story?). It's a simple three-act structure of customer involvement, and at every step you have to be very cognizant of the antagonists. The mentor is Glinda, the good witch of the north, or Obi-Wan Kenobi or Yoda to Luke Skywalker. What is your brand promise? What do people emotionally get by interacting with your brand and its product/service? What is the unique gift that comes from operating in your brand? The gift isn't just a physical item; it's more of a metaphysical relationship that the customers have with your brand because it levels them up in some way. Finally, you want to explore the personality of the brand. Park relies on the 12 basic archetypes created by Swiss psychologist Carl Jung. They are the same archetypes that play through our mind whenever we meet someone we don't know and try to figure out where they fall within the prism. Often brands have a primary archetype and one or two sub-archetypes, everything from "regular guy/gal," to "hero," to "ruler," to "jester." When you do a little archetype study, you'll see how it brings a human element to somewhat of an inhuman object that most brands are. At this point, you're starting to shape the brand: imagery, looks, feels, colors you're going to use to express your brand story through this archetypal personality. This is every car chase, explosion, or near-death experience you've ever read or seen in a movie. It's typically the longest chapter or scene. Awareness has to do with the question, "How do people hear about your brand?" Online? Word of mouth? Advertising? A combination? Adoption: as we mentioned before, adoption is the stage of "Okay, I'll try it." It doesn't mean the customer is going to keep you around, but it does mean that they're going to bring you into their life. You must figure out where this happens and how you tell your story at that point in the customer journey. Finally, there's appreciation. This is where you're leveling them up, where they appreciate what you do and start to talk about it. Now they're starting to ritualize you into their life. Here in chapter 7, you look at those three stages for your three main audiences, and you start developing a story map that answers, "Which story do I tell to whom? When do I tell it? Where? Why?" In stories, when heroes leave the ordinary world and enter the extraordinary, battling external (dragons, demons) and internal (regret/fear) antagonists, they are leveling up. When they finally slay these antagonists, they become better than they were before and return back to their ordinary world, ready to pour themselves out into the communities around them. From a brand standpoint, if you get your audience involved in your story and they experience all this stuff that Campbell talks about, you still have to identify what the victories are. Your hope is that they will have tried your product/service and loved it so much (and be so much better for it) that they'll want more. Take that same story map from chapter 7 and apply it here. How do you celebrate the victories within your stories in each step of your customer's journey (within awareness, adoption, and appreciation)? An awareness victory celebration might be, "Thanks for coming over!" Or it might be an offer to try your 30-day free trial. Maybe you even offer someone to help them through the trial. Then let's say 30 days in, your customer loves it, swipes his card, and enters the adoption phase. How do you celebrate the victories in that stage? Does he get some free add-ons? Does he get 50 percent off his first month if he refers a friend? Then when he gets to the appreciation stage, how do you arm him with the stories you want him to share as your evangelist, both online and offline? And how do you celebrate that? Do you level him up and give him more perks or benefits? Fan the flames of brand evangelism. We can go days without eating or drinking, but we can only go about 35 seconds without creating meaning out of what goes on around us. In every single story you tell about your brand, there is infused meaning. You have to be very careful to make sure you're articulating the meaning you want your audience to connect with. Otherwise, they will make up their own meaning about your brand, and most of the time they'll be incorrect. Then, how do you connect those values in the stories you tell? What is the moral of your story? Every story has a universal truth attached to it; you have to be cognizant that yours is crystal clear. To see the importance of Chapter 10, all you have to do is look at the James Bond franchise. 26 movies, several leading men, yet they have been delivering for half a century a quality product around the James Bond franchise. That's what you're trying to do with your B2B storytelling: create repeated ritual around your stories. This is where you've leveled customers up to appreciation/evangelism. Now they return home with your product/service in their pocket, and all is right with the world. What you want to figure out is how you can design the ritualistic use of your product/service into the lives of your audience, then encourage them to share through word of mouth how you're helping them in their lives. It's not a "one and done." You take them from their ordinary world to an extraordinary one, then back home. And then you do it all again. As you can see, the greatest stories in history have stores of valuable treasure within their structures, ready for the business world to mine out. You can follow Park's story map to become so good at B2B storytelling that the smallest presentations of your brand will tell the story. It is within your reach to become a master of the art form--and make a lot of money doing it. This post is based on an interview with Park Howell from Business of Story.